Alcopops containing caffeine and alcohol have been removed from the shelves in the US, following reports of students becoming dangerously drunk. The move comes amid anxiety about similar drinks in countries from Scotland to Mexico. A few weeks ago in New York a group of college students gathered at a vigil. They sang songs, and held candles as they mourned the passing of a friend. The scene can be seen on YouTube. What makes it slightly surreal is that the gathered crowd is lamenting the demise of an alcoholic drink, Four Loko. 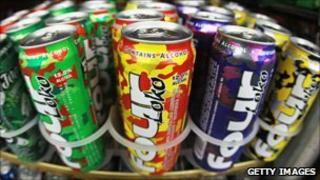 From Monday, Four Loko will no longer exist in its original incarnation - as a mix of alcohol and caffeine in a can - on the orders of the US Food and Drug Administration (FDA). The fruit-flavoured energy drink contains 12% alcohol, making it about three times as strong as a regular beer, and one 23.5oz (694ml) can contains as much caffeine as a tall Starbucks coffee. It is a combination those who drink it say tastes great and makes you feel good. But others describe it as a "blackout in a can", and blame it for landing a number of students in hospital. Four Loko is one of a range of such drinks on sale in the US, including Joose and Core El Jefe. Last month, the US Food and Drug Administration called on the top four manufacturers to take them out of circulation by 13 December. Dr Joshua M Sharfstein, the FDA's principal deputy commissioner, said evidence suggested that the mix of caffeine and alcohol posed a "public health concern". Four Loko will continue to be on sale, but now without the caffeine. The FDA's action came after some highly publicised scandals, in which the drinks were reported to have caused serious illness, including one at Ramapo College in New Jersey. "My friend had [a] little under three cans in one hour," explains a student at the college, James Kulinski. "He didn't know what he was doing. He was a mess - he had no motor skills and no ability to communicate." James has tried Four Loko and Joose and isn't a huge fan. He says most people who drank it on campus were "inexperienced drinkers" who saw it, at around $1.50, as an inexpensive way to get drunk. Ramapo College later banned Four Loko from campus. It has also been banned from the entire state of Washington, after reports of dozens of young people being taken ill - including nine students from Central Washington university who were admitted to hospital in October. "It's time to bring an end to the sale of alcoholic energy drinks," said Washington State Attorney General Rob McKenna at the time. "They're marketed to kids by using fruit flavours that mask the taste of alcohol and they have such high levels of stimulants that people have no idea how inebriated they really are. They're packaged just like non-alcoholic drinks, but include a dangerous dose of malt liquor." CANADA - Food and drug regulations do not permit the direct addition of manufactured caffeine in pre-mixed alcoholic energy drinks. They do allow caffeine in alcoholic beverages if it's derived from such natural sources as guarana. MEXICO - Senate health committee has approved a measure to cease the sale of caffeinated alcoholic drinks in bars and nightclubs. SCOTLAND - Scottish Labour Party calling for a ban on caffeinated drinks such as the fortified wine Buckfast. AUSTRALIA - Ministerial council on drug strategy is considering regulation to address the growing concerns over the drinks. The government of New South Wales is looking at banning the sale of the drinks from clubs and bars. In fact Four Loko, which has been sold in 46 states across America, has built up a cult following among college students. More than 100,000 have signed up to various Facebook groups protesting against the drink's demise. The beverage hit the shops in 2008, the brainchild of three friends who met at Ohio State University - Chris Hunter, Jeff Wright and Jaisen Freeman - and went on to found the company Phusion Projects. Phusion Projects disputes claims its drink leads to alcohol poisoning. "We have repeatedly contended - and still believe, as do many people throughout the country - that the combination of alcohol and caffeine is safe," said Messrs Hunter, Wright and Freeman in a statement. "If it were unsafe, popular drinks like rum and colas or Irish coffees that have been consumed safely and responsibly for years would face the same scrutiny that our products have recently faced." But some studies do show that the mix of caffeine and alcohol can have adverse effects. The University of Florida surveyed 802 college students who had mixed alcohol and caffeine and found they were three times more likely to leave a bar highly intoxicated and four times more likely to want to drive, compared with drinkers who did not consume alcoholic energy drinks. Caffeine is a mild stimulant that increases alertness and heart rate, while alcohol is a depressant that causes lethargy and loss of normal faculties. "When someone mixes them, we believe that the caffeine masks the depressant effects of the alcohol," explains Bruce Goldberger, a toxicologist from the University of Florida who helped write the research. "Our research found that the person's perception of their degree of impairment was masked by the stimulating effect caused by the caffeine." Mr Goldberger believes that this combination led to more students staying awake longer, and therefore wanting to drink for longer. Another study from Wake Forest university, which surveyed 697 students, found those who had consumed caffeinated alcoholic beverages were more likely to drink drive, take advantage of someone sexually, or end up needing medical treatment. According to Aaron White of the National Institute on Alcohol Abuse and Alcoholism (NIAAA), a lot depends on the speed at which the drink is consumed. Drinking a few cans of Four Loko in quick succession is very different to someone drinking a bottle of wine over dinner, followed by coffee, he argues. "In one can you have the equivalent of almost a bottle of wine and a couple of cups of coffee. That's a lot of alcohol and caffeine all at once. And young people tend to drink these things quickly." Concerns over the drinks are not confined to the United States. The caffeinated wine Buckfast has been linked to youth crime in Scotland. Mexico and Australia are both considering regulating the sale of the drinks on health grounds. Last week, before the effective ban in the US took force, retailers were reporting an increase in sales of the drink. At the Bridge liquor store in Rhode Island, manager Jeff Schultz said he couldn't keep up with demand. "Once it hit the news we couldn't keep it in stock. We've been through hundreds of the cases." For the health of America's students the FDA's action is likely to be for the best, but many will mourn it. "Thanks for introducing me to my 1st blackout. Its so hard to say goodbye," writes one fan, on one of the many Four Loko groups on Facebook. Another simply says, "R.I.P FOUR LOKO WE MISS U AND I WANT MORE."